Exclusive picture shows a 7-inch screen between speedometer and tachometer. MG’s Hector will also feature a tyre pressure monitoring system, with temperature readouts. The screen will let you skim through a host of other functions like audio, navigation and car info. Graphic on the instrument cluster also shows a massive panoramic sunroof. The midsize SUV segment is heating up quite a bit. Tata’s just unleashed the Harrier at a mouthwatering price tag, and Kia has decided to whet our appetite by teasing the SP2i SUV prototype. But, there’s some more good news coming our way in the form of the MG Hector. And, we’ve got an exclusive scoop for those waiting for the Hector. 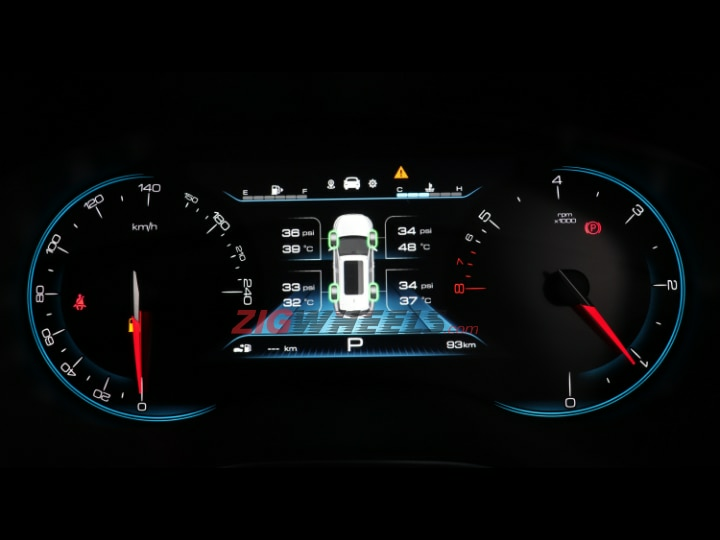 We’ve got our hands on an image of the instrument cluster that shows a 7-inch full LCD display. The image also confirms that the Hector will come equipped with a tyre pressure monitoring system with temperature readouts for each tyre. Smaller details include a distance to empty readout at the bottom left, an odometer on the bottom right and a digital fuel and temperature gauge at the top. There’s a scrollable menu too, that will let one sift through details of music, navigation, settings and car parameters. The large ‘P’ readout at the bottom leads us to believe that an automatic variant is in the works as well. Also, don’t miss the massive panoramic sunroof in the graphic. MG’s big bet for India is expected to be launched by June. We’re expecting the Hector to be pegged against the likes of the Tata Harrier, Mahindra XUV500 and the Jeep Compass. This means an expected price range of Rs 15 lakh - Rs 20 lakh (ex-showroom).